In chess, the chess piece relative value system conventionally assigns a point value to each piece when assessing its relative strength in potential exchanges. These values help determine how valuable a piece is strategically. They play no formal role in the game but are useful to players and are also used in computer chess to help the computer evaluate positions. Calculations of the value of pieces provide only a rough idea of the state of play. The exact piece values will depend on the game situation, and can differ considerably from those given here. In some positions, a well-placed piece might be much more valuable than indicated by heuristics, while a badly placed piece may be completely trapped and, thus, almost worthless. Valuations almost always assign the value 1 point to pawns (typically as the average value of a pawn in the starting position). Computer programs often represent the values of pieces and positions in terms of 'centipawns' (cp), where 100 cp = 1 pawn, which allows strategic features of the position, worth less than a single pawn, to be evaluated without requiring fractions. Edward Lasker said "It is difficult to compare the relative value of different pieces, as so much depends on the peculiarities of the position...". Nevertheless, he said that bishops and knights (minor pieces) were equal, rooks are worth a minor piece plus one or two pawns, and a queen is worth three minor pieces or two rooks (Lasker 1915:11). The following table is the most common assignment of point values (Capablanca & de Firmian 2006:24–25), (Seirawan & Silman 1990:40), (Soltis 2004:6), (Silman 1998:340), (Polgar & Truong 2005:11). These values are very reliable in endgames with a limited number of pieces. The oldest derivation of the standard values is due to the Modenese School (Ercole del Rio, Giambattista Lolli, and Domenico Lorenzo Ponziani) in the 18th century (Lolli 1763:255) and is partially based on the earlier work of Pietro Carrera (Carrera 1617:115–21). The value of the king is undefined as it cannot be captured, let alone traded, during the course of the game. Some computer chess programs give the king an arbitrary large value (such as 200 points or 1,000,000,000 points, for example Zillions of Games gives 106,332 points for king versus 14,332 points for queen in centre) to indicate that the inevitable loss of the king due to checkmate trumps all other considerations (Levy & Newborn 1991:45), as that is the easiest way to create a computer chess program due to technology limits. In the endgame, where there is usually little danger of checkmate, the fighting value of the king is about four points (Lasker 1934:73). In the endgame, a king is more powerful than a minor piece but less powerful than a rook. Julian Hodgson also puts its value at four points (Aagaard 2004:12). The king is good at attacking and defending nearby pieces and pawns. It is better at defending such pieces than the knight is, and it is better at attacking them than the bishop is (Ward 1996:13). This system has some shortcomings. Combinations of pieces do not always equal the sum of their parts; for instance, two bishops are usually worth slightly more than a bishop plus a knight, and three minor pieces (nine points) are often slightly stronger than two rooks (ten points) or a queen (nine points) (Capablanca & de Firmian 2006:24), (Fine & Benko 2003:458, 582). Chess-variant theorist Betza identified the 'leveling effect', which causes reduction of the value of stronger pieces in the presence of opponent weaker pieces, due to the latter interdicting access to part of the board for the former in order to prevent the value difference from evaporating by 1-for-1 trading. This effect causes 3 queens to badly lose against 7 knights, even though the added piece values predict that the knights player is two knights short of equality. In a less exotic case it explains why trading rooks in the presence of a queen-vs-3-minors imbalance favors the queen player, as the rooks hinder the queen, but not so much the minors. The bishop pair is worth ​7 1⁄2, half a pawn more than the individual values of its constituent bishops combined. The position of the pieces also makes a significant difference, e.g. pawns near the edges are worth less than those near the centre, pawns close to promotion are worth far more, pieces controlling the centre are worth more than average, trapped pieces (such as bad bishops) are worth less, etc. Although the 1-3-3-5-9 system of point totals is the most commonly given, many other systems of valuing pieces have been proposed. Several systems give the bishop slightly more value than the knight. A bishop is usually slightly more powerful than a knight, but not always; it depends on the position (Evans 1958:77,80) (Mayer 1997:7). A chess-playing program was given the value of 3 for the knight and 3.4 for the bishop (Mayer 1997:5). Note: Where a value for the king is given, this is used when considering piece development, its power in the endgame, etc. There are adjustments for the rank and file of a pawn and adjustments for the pieces depending on how open or closed the position is. Bishops, rooks, and queens gain up to 10 percent more value in open positions and lose up to 20 percent in closed positions. Knights gain up to 50 percent in closed positions and lose up to 30 percent in the corners and edges of the board. The value of a good bishop may be at least 10 percent higher than that of a bad bishop (Berliner 1999:14–18). Different types of doubled pawns (from Berliner). There are different types of doubled pawns; see the diagram. White's doubled pawns on the b-file are the best situation in the diagram, since advancing the pawns and exchanging can get them un-doubled and mobile. The doubled b-pawn is worth 0.75 points. If the black pawn on a6 were on c6, it would not be possible to dissolve the doubled pawn, and it would be worth only 0.5 points. The doubled pawn on f2 is worth about 0.5 points. The second white pawn on the h-file is worth only 0.33 points, and additional pawns on the file would be worth only 0.2 points (Berliner 1999:18–20). As already noted when the standard values were first formulated (Lolli 1763:255), the relative strength of the pieces changes as a game progresses to the endgame. The value of pawns, rooks and, to a lesser extent, bishops may increase. The knight tends to lose some power, and the strength of the queen may be slightly lessened, as well. Some examples follow. In the endgame, a rook and one pawn are equal to two knights; and equal to or slightly weaker than a bishop and knight. A rook and two pawns are equal to two bishops (Alburt & Krogius 2005:402–3). Bishops are often more powerful than rooks in the opening. Rooks are usually more powerful than bishops in the middlegame, and rooks dominate the minor pieces in the endgame (Seirawan 2003:ix). As the tables in Berliner's system show, the values of pawns change dramatically in the endgame. In the opening and middlegame, pawns on the central files are more valuable. In the late middlegame and endgame the situation reverses, and pawns on the wings become more valuable due to their likelihood of becoming an outside passed pawn and threatening to promote. 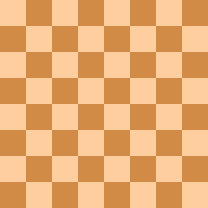 When there is about fourteen points of material on both sides, the value of pawns on any file is about equal. After that, wing pawns become more valuable (Berliner 1999:16–20). C.J.S. Purdy gave minor pieces a value of ​3 1⁄2 points in the opening and middlegame but 3 points in the endgame (Purdy 2003:146, 151). White should not exchange a bishop and knight for a rook and pawn with 1. Nxf7? There are shortcomings of any piece valuation system. For instance, positions in which a bishop and knight can be exchanged for a rook and pawn are fairly common (see diagram). In this position, White should not do that, e.g. This seems like an even exchange (6 points for 6 points), but it is not because two minor pieces are better than a rook and pawn in the middlegame (Silman 1998:340–42). Pachman also notes that two bishops are almost always better than a rook and pawn (Pachman 1971:11). In most openings, two minor pieces are better than a rook and pawn and are usually at least as good as a rook and two pawns until the position is greatly simplified (i.e. late middlegame or endgame). Minor pieces get into play earlier than rooks and they coordinate better, especially when there are many pieces and pawns on the board. Rooks are usually developed later and are often blocked by pawns until later in the game (Watson 2006:102). This situation in this position is not very common, but White has exchanged a queen and a pawn (10 points) for three minor pieces (9 points). Three minor pieces are usually better than a queen because of their greater mobility, and the extra pawn is not important enough to change the situation (Silman 1998:340–41). Three minor pieces are almost as strong as two rooks (Pachman 1971:11). Two minor pieces plus two pawns are almost always as good as a queen. Two rooks are better than a queen and pawn (Berliner 1999:13–14). Many of the systems have a 2-point difference between the rook and a minor piece, but most theorists put that difference at about ​1 1⁄2 points, see The exchange (chess)#Value of the exchange. In open positions, a rook plus a pair of bishops is stronger than two rooks plus a knight (Kaufeld & Kern 2011:79). This situation is very rare. Black is ahead by counting material but in reality white is much better. White's queenside is perfectly defended. White can slowly build up pressure on black's weakened kingside. Black's extra queen has no target. White's dark-squared bishop is stronger than black's passive rook on f8. Principle of the redundancy of major pieces. Neither queen does anything that the other one cannot do. ^ In the 1817 edition of Philidor's Studies of Chess, the editor (Peter Pratt) gave the same values. Howard Staunton in The Chess-Player's Handbook and a later book gave these values without explaining how they were obtained. He notes that piece values are dependent on the position and the phase of the game (the queen typically less valuable toward the endgame) (Staunton 1847, 34) (Staunton 1870, 30–31). ^ Stockfish gives exact values for pawns, knights, bishops, rooks, and queens as 128, 782, 830, 1289, and 2529 in the opening and 213, 865, 918, 1378, and 2687 in the endgame. The opening is defined as when the combined opening values of all pieces on the board except for pawns and kings (non-pawn material) is less than 15258 and the endgame is when the non-pawn material is greater than 3915. When it is neither the opening nor the endgame, the piece values change linearly between the opening and endgame values with respect to non-pawn material. a-file rook = ​4 1⁄2, h-file rook = ​5 1⁄4 (Lasker 1947:107). ^ In his book New Ideas in Chess, Evans initially gives the bishop a value of ​3 1⁄2 points (the same as a knight) but three pages later on the topic of the bishop pair states that theory says that it is actually worth about ​1⁄4 point more. ^ All values rounded to the nearest ​1⁄4 point. Kaufman elaborates about how the values of knights and rooks change, depending on the number of pawns on the board: "A further refinement would be to raise the knight's value by ​1⁄16 and lower the rook's value by ​1⁄8 for each pawn above five of the side being valued, with the opposite adjustment for each pawn short of five." ^ All values rounded to the nearest ​1⁄4 point. Kaufman's experience in Chess engine development helped him establishing a "scientific" method in calculating the relative value of the pieces. Work based on the study of thousands of games of elite players, analysed by the Chess engines: "A further refinement would be to raise the knight's value by ​1⁄16 and lower the rook's value by ​1⁄8 for each pawn above five of the side being valued, with the opposite adjustment for each pawn short of five." This page was last edited on 2 April 2019, at 02:59 (UTC).